The diamond joint, one of my personal favorites, is one of the simplest, yet most elegant techniques to roll a trick joint. Although it looks like a complicated roll, with ample practice, this joint can easily be mastered. Begin by rolling a fully-packed standard joint (preferably king size) with a crutch. Roll two identical crutchless joints. Leave both ends untied with a few centimeters (one finger nail length) of open paper. Take both crutchless joints and set them parallel to each other. Pick a side and place one sticky strip two finger nail lengths down on the joints and wrap the remaining sticky around the joints. Twist together the ends closest to the sticky strip. This will be the top of the Diamond Joint. Place a thumb on the sticky strip. Gently form a gap between the joints and carefully bend the middle of each joint, away from one another, to resemble the shape of a diamond. Flip the combined joints over to continue to the next step. This time, stick a second sticky strip one-finger nail length down the end of the two joints (leaving room to add the fully-packed standard joint). Take a third sticky strip and place it directly above the previous sticky strip, leaving half a fingernail length left of the open paper. This purpose of this step is to seal off any potential gaps, without distorting the open paper’s shape. Again, carefully bend the middle of the two joints to adjust the diamond form. On the same side, use a pair of scissors to cut out the section of open paper that merges at the base of the diamond, creating a larger hole where the fully-packed standard joint will be inserted. After clearing out the base of the diamond, insert the fully-packed standard joint while using a sticky strip to secure the junction of the joints. Place another sticky strip one finger nail length below where the joints merge. Once in place, alternate looping the rest of the sticky strip through the center of the diamond then around the base. Repeat for the other side of the diamond (If the diamond joint is still not sturdy, or contains air holes, then simply repeat step 8 until fully secure). 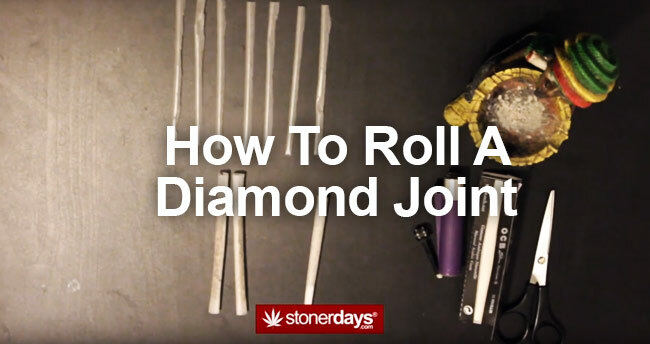 Finally, skim the flame of a lighter across the wet sticky strips to reinforce bond of the rolling papers; reshape the diamond form, and that’s how you roll a diamond joint. This entry was posted in Featured, Stoner Blog, Stoner Guide and tagged diamond joint.